For millions of people, hip replacement surgery can be a lifesaver, and a way to lead a more productive, ambulatory, and comfortable life. But here's the bad news - some hip replacement devices, previously thought to be safe, are not. Two leading hip-replacement manufacturers - DePuy and Stryker - have had their hip implant products recalled due to dangerous defects. If you or someone you love have had hip replacement surgery and the replacement device was manufactured by either of these companies - DePuy or Stryker - it would be wise to consult with a Boston, Massachusetts defective hip implant lawyer. Our law offices possess the expertise to litigate cases against defective hip implant manufacturers, and hold them accountable for their defective products. Do yourself a favor and call us right now at (617) 285-3600 or (781) 320-0062 and we will return your call promptly, to discuss your situation. We offer our personal-injury clients a FREE INITIAL CONSULTATION and will respond promptly to your inquiry about your Massachusetts hip replacement surgery. You will pay absolutely NO FEES unless we recover financial damages on your behalf. If necessary, we can also make house calls to our potential clients, and have offices conveniently located off Route 128 in Westwood, Massachusetts, as well as in downtown Boston. The result? In March 2010, DePuy apparently discovered that its ASR hip replacements were failing at a much higher rate than they ever anticipated. The FDA received almost 400 complaints in two years from patients in the USA who received the DePuy hip implants. By August of 2010, DePuy issued a voluntary recall of its ASR products. 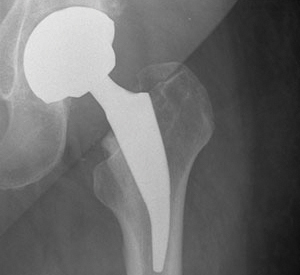 These hip implants were found to be defective due to the friction between its two metal components. Furthermore, even if someone has the defective device replaced, there can still be deadly fragments of the device left behind in the body. DePuy acknowledged why its ASR products needed to be recalled, citing failures due to not only infection, bone fracture and dislocation, but more importantly, to component loosening, misalignment and metal sensitivity. A second company, called Stryker Orthopedics, also had to recall two of its devices that were used in hip replacement surgeries. Stryker, whose biotech division is located in Hopkinton, Massachusetts, stated back in 2012 that it would stop global distribution of its Rejuvenate and ABG II modular-neck stems that are used in conjunction with artificial hips. Patients have reported that the Stryker systems caused them considerable pain and also swelling in the surrounding tissues of the replaced hip. If you underwent hip implant surgery and have had problems such as difficulty walking, or any kind of hip pain, the most important thing you can do is speak first with your doctor or orthopedic surgeon. If you know for sure that a DePuy or Stryker medical device was used in your surgery, you may very well have legal grounds for a Massachusetts defective hip implant lawsuit. When you speak with the Law Offices of William D. Kickham, we can determine whether or not you have a viable legal claim in this regard. You may be entitled to receive substantial financial compensation for your pain, suffering, medical expenses, rehabilitation and even your replacement surgery. Our knowledgeable Boston defective hip replacement attorneys know how to seek all of the financial damages that you deserve for your entire case - including rehabilitation and physical therapy, lost income, loss of consortium claims (for married persons,) diminished future earnings, and pain and suffering. We are aggressive Boston defective hip implant lawyers, and will not hesitate to take these cases to trial if the circumstances warrant it. We know how to be aggressive in such cases, when the situation requires it, and we know when to negotiate. Contact the Boston personal injury law firm that is experienced in defective hip implants: The Law Offices of William D. Kickham. Call us at (617) 285-3600 or (781) 320-0062. We have a proven record of success in Boston personal injury lawsuits. For more important information about how to initially respond to suffering a personal injury in Massachusetts, click here to receive our FREE article "The Top 10 Things To Do After Suffering An Accident Or Injury In Massachusetts." This easy-to-understand document contains important information about how to protect your legal rights, following an accident or injury caused by another person's negligence - and this includes defective hip replacements and defective medical devices. We offer our personal-injury legal clients a FREE INITIAL CONSULTATION and will respond promptly to your inquiry about your hip replacement surgery. If necessary, we can travel to your hospital or private home, to assist with your questions. You will pay absolutely NO FEES unless we win your case on your behalf. Contact us at (781) 320-0062 or (617) 285-3600 or click here to send us a confidential email. Boston, Massachusetts personal injury lawyer William D. Kickham is a legal commentator and legal expert for prestigious local and national media. He has been featured on Court TV (now In Session on HLN,) Fox News TV-25/Boston, The Boston Herald, WBZ-AM Radio 1030, WCVB-TV5/Boston, Nightside With Dan Rea, Greater Boston With Emily Rooney, Money Matters Radio/Boston, and The Metro Newspaper/ Boston. It's a smart move to put that kind of expertise on your side.